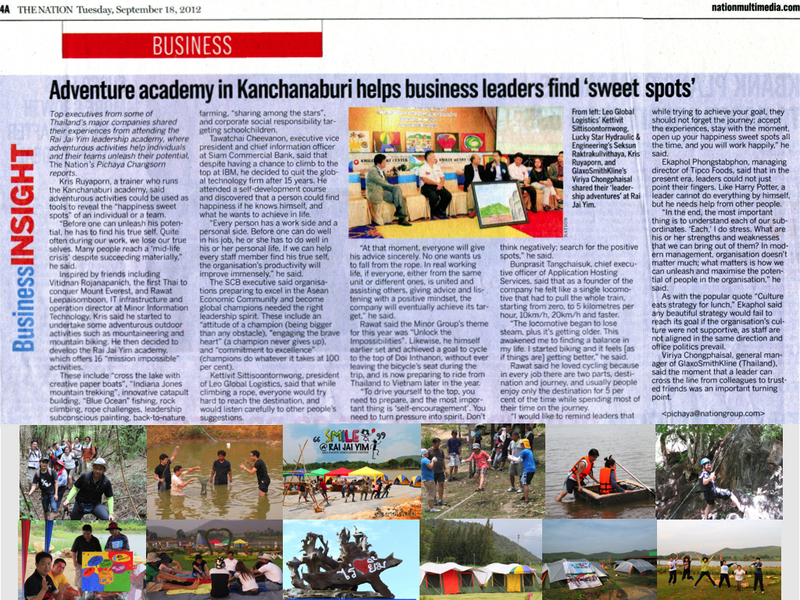 Top executives from some of Thailand's major companies shared their experiences from attending the Rai Jai Yim leadership academy, where adventurous activities help individuals and their teams unleash their potential..
Kris Ruyaporn, a trainer who runs the Kanchanaburi academy, said adventurous activities could be used as tools to reveal the "happiness sweet spots" of an individual or a team. "Before one can unleash his potential, he has to find his true self. Quite often during our work, we lose our true selves. Many people reach a 'mid-life crisis' despite succeeding materially," he said. Inspired by friends including Vitidnan Rojanapanich, the first Thai to conquer Mount Everest, and Rawat Leepaisomboon, IT infrastructure and operation director at Minor Information Technology, Kris said he started to undertake some adventurous outdoor activities such as mountaineering and mountain biking. He then decided to develop the Rai Jai Yim academy, which offers 16 "mission impossible" activities. These include "cross the lake with creative paper boats", "Indiana Jones mountain trekking", innovative catapult building, "Blue Ocean" fishing, rock climbing, rope challenges, leadership subconscious painting, back-to-nature farming, "sharing among the stars", and corporate social responsibility targeting schoolchildren. Tawatchai Cheevanon, executive vice president and chief information officer at Siam Commercial Bank, said that despite having a chance to climb to the top at IBM, he decided to quit the global technology firm after 15 years. He attended a self-development course and discovered that a person could find happiness if he knows himself, and what he wants to achieve in life. "Every person has a work side and a personal side. Before one can do well in his job, he or she has to do well in his or her personal life. If we can help every staff member find his true self, the organisation's productivity will improve immensely," he said. The SCB executive said organisations preparing to excel in the Asean Economic Community and become global champions needed the right leadership spirit. These include an "attitude of a champion (being bigger than any obstacle), "engaging the brave heart" (a champion never gives up), and "commitment to excellence" (champions do whatever it takes at 100 per cent). Kettivit Sittisoontornwong, president of Leo Global Logistics, said that while climbing a rope, everyone would try hard to reach the destination, and would listen carefully to other people's suggestions. "At that moment, everyone will give his advice sincerely. No one wants us to fall from the rope. In real working life, if everyone, either from the same unit or different ones, is united and assisting others, giving advice and listening with a positive mindset, the company will eventually achieve its target," he said. Rawat said the Minor Group's theme for this year was "Unlock the Impossibilities". Likewise, he himself earlier set and achieved a goal to cycle to the top of Doi Inthanon, without ever leaving the bicycle's seat during the trip, and is now preparing to ride from Thailand to Vietnam later in the year. "To drive yourself to the top, you need to prepare, and the most important thing is 'self-encouragement'. You need to turn pressure into spirit. Don't think negatively; search for the positive spots," he said. Bunprasit Tangchaisuk, chief executive officer of Application Hosting Services, said that as a founder of the company he felt like a single locomotive that had to pull the whole train, starting from zero, to 5 kilometres per hour, 10km/h, 20km/h and faster. "The locomotive began to lose steam, plus it's getting older. This awakened me to finding a balance in my life. I started biking and it feels [as if things are] getting better," he said. Rawat said he loved cycling because in every job there are two parts, destination and journey, and usually people enjoy only the destination for 5 per cent of the time while spending most of their time on the journey. "I would like to remind leaders that while trying to achieve your goal, they should not forget the journey: accept the experiences, stay with the moment, open up your happiness sweet spots all the time, and you will work happily," he said. Ekaphol Phongstabphon, managing director of Tipco Foods, said that in the present era, leaders could not just point their fingers. Like Harry Potter, a leader cannot do everything by himself, but he needs help from other people. "In the end, the most important thing is to understand each of our subordinates. 'Each,' I do stress. 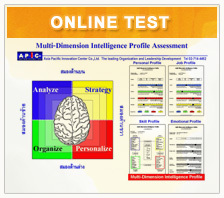 What are his or her strengths and weaknesses that we can bring out of them? In modern management, organisation doesn't matter much; what matters is how we can unleash and maximise the potential of people in the organisation," he said. As with the popular quote "Culture eats strategy for lunch," Ekaphol said any beautiful strategy would fail to reach its goal if the organisation's culture were not supportive, as staff are not aligned in the same direction and office politics prevail. Viriya Chongphaisal, general manager of GlaxoSmithKline (Thailand), said the moment that a leader can cross the line from colleagues to trusted friends was an important turning point.